Ease of Use. Every action in our system is point-and-click and requires no training or technical knowledge for library staff, faculty, or students. There is no need to spend additional money or time on staff training. Effective Copyrighted Document Management. Docutek ERes is the only comparable system on the market that enables an institution to effectively manage and track the use of copyright-protected documents online, and to enforce copyright policies specific to the school. Docutek ERes lets you maintain a publishers/rights holders database and will automatically generate a variety of permission request letters. The Lowest Total Cost of Ownership. Docutek ERes integrates many different library services - like electronic document delivery and Internet resources management - into a single package, all available through an easy-to-use Web interface. The annual license fee covers full system support and maintenance, and there's no charge for upgrades. Minimal administration. Our technical staff will install your Docutek products and make sure that any technical questions are promptly resolved - at no extra charge to you. In addition, the Docutek Support Team will assist you in maintaining your Docutek installation, including providing and installing updates. The quickest and easiest way to start offering reserve readings online. We can have you running a full-featured electronic reserves system within two weeks of the receipt of a purchase order! We can even host your system on one of our secure servers, so you don't need to purchase and maintain a server computer locally. 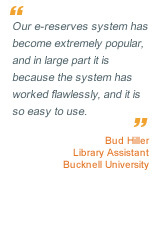 Because we completely customize, set up, and install the system, it couldn't be easier for college and university faculty, staff - and libraries - to start putting reserve documents online!